Tesla guitarist Frank Hannon has been interviewed by various radio stations about working with Def Leppard's Phil Collen. He says the next Tesla studio album, which Phil is producing, could be released in Spring 2017 and it about 75 percent finished. As mentioned the album is being produced on the road and during tour gaps back in Tesla home studio in Sacramento, California. Frank did a number of radio interviews recently and talked a lot about working with Phil and touring with Def Leppard. He recalled how they first met Phil Collen and Steve Clark in Amsterdam in May 1987 and also mentions his upcoming 50th birthday (3rd October). Read many quotes below and listen to five of his interviews. "Yeah, yeah and it's flowing man. It's really flowing. You know I had the idea for Phil to produce our Into The Now album when we got back together in 2000. But due to scheduling and Tesla really wasn't quite ready at that point yet but good things happen at the right time and now is the right time. And so far every move we've made with Phil and his advice he's given us and help has really just, really just exploded with enthusiasm and it's been great." "Yeah and we're more open minded than ever. When we heard the song we're like wow that sounds like Tesla. That sounds like us and the fact that he was passionate about the band and brought that passion and brings the passion to us. It just works you know because Ronnie (Montrose) had the passion. Phil Collen has the passion for our band. You know it's rare to have an artist that's as successful as he Phil Collen is to take a passion in another band. Those are the best moment in music is when other artists get together collaborate and put things together and that's what's happening with Tesla and Def Leppard right now. It's really cool." "On the tour we're working in the dressing rooms and the hotel rooms. We set up the recording studio in the rooms and we flesh out ideas and we hammer them out and it can be a tour bus. It can be a dressing room. It doesn't matter we're working together and doing things that we. You know we used to waste a lot of time but now we don't." "Right now we're working on a new album with Phil. The live album and Save That Goodness is just the beginning. We're in the middle of recording 12 new songs right now. They're about 75 percent done. In fact today when I get to the gig we're probably gonna be hammering out some guitar parts in the dressing room on the computer." "The record's supposed to be out hopefully in the Spring. A new full on studio album produced by Phil Collen." "Yeah and he's a very energetic person. He's health conscious you know. He's got a lot of energy you know like we do. We're very energetic. We're kind of borderline hyper, ADHD. And so you know when you've got a guy that can help you channel that energy into a creative thing. It really makes you productive and Tesla is really productive right now and it helps to have a guy push you." Is he a coach or is he a co-partner? "All of those things. He's a coach, he's a friend, he's an inspiration man." "It's really great to have camaraderie with guys like Def Leppard. We've been friends with them since the beginning and they've brought us back into the big house and really been helping us a lot you know. 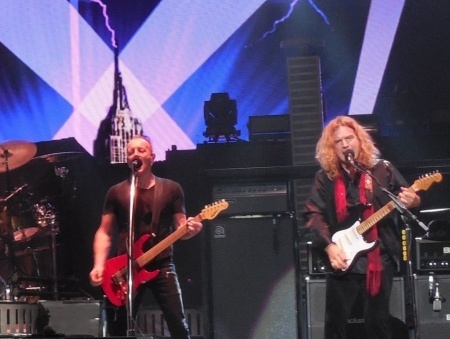 Tesla is really doing a lot of positive things thanks to Def Leppard." "Yeah and the great news is we're writing a new album on the road while we're in the dressing room. You know we all have ideas and we get together in the dressing room and work on it with Phil on a computer. Which is what technology has brought to the table nowadays. You can make an album in a dressing room. It's pretty awesome." "Right now we have a new single called Save That Goodness and it's on our 30th anniversary Mechanical Resonance LIVE! album." "Yeah we've got a great energy going man with Phil and myself, Brian and the band. Jeff's doing great. It's really great to have an outside influence from a guy that you respect musically and he's got a lot of energy. Tesla is not a group of lazy guys by any means. We like to work and create and we got a producer now who is really motivating us and that would be Phil Collen and it's just awesome." "It came up in the dressing room last year on the road. Phil and the band we were reminiscing about how how we met in Amsterdam. Phil and Steve Clark came to our club. They sat in and jammed with us. We did Rock Of Ages and I don't know...Sin City by AC/DC. Him being a fan of our first album. He said to us, hey guys you know you should re-record your first album and out out a new live version of it. And then oh by the way I've got this song I've been working on and what do you think. And we really liked it and it reminded us of our old stuff like Little Suzi's on the up from our first album that was brought to us by Ronnie Montrose." "So it was kind of the same thing. Just a great vibe and forced us to go back and re learn our first album. Some of those songs we hadn't played in years." "It's really been a dream. You know for one 30 years later we're still doing it and 30 years later we're with great bands and great people. The guys in Def Leppard and notably Phil Collen, the guitarist of Def Leppard, has really taken a special interest in our band and has encouraged us to do things that we wouldn't normally do and helped us write a new song." "We have a brand new song out called Save That Goodness and thing's are really just on a very positive vibe right now for Tesla." "We have and it started 30 years ago in a club in Amsterdam in Holland. We were playing on our first album over there. Tesla in a club and Phil Collen and Steve Clark and Rick Allen from Def Leppard came to the club and they ended up on stage with us and we jammed some AC/DC songs and we've been friends ever since." "It's actually just this week. Its' called Mechanical Resonance LIVE!. Mechanical Resonance was our first album and we re-recorded it live in concert." "From the 80s I would have to say Def Leppard is the cream of the crop. Pyromania is probably the best album." "The best way I can describe it and what brings the most joy is the guy has passion. And when you've got an outside artist that you look up to, show passion for what you do. It really makes you feel good and it motivates you. And you know he's very passionate about Tesla and he came to us in the dressing room one night and said guys I really love your band and here's some ideas I have. And you know I tell people all the time that I equate it to a coach that coaches a team. You know you can have a great football team with great athletes but that team needs an outside person from the outside to motivate them. And that's basically what's been going on with Phil Collen, Def Leppard's lead guitar player. He's been motivating us and coaching us and we needed that man it was a shot in the arm for us." "We're working on a new album right now with Phil Collen in the dressing room. We have the dressing room set up as the recording studio when we do our shows. Before we do our show we work on the new songs. But right now we've got a brand new album called Mechanical Resonance LIVE!. It's a celebration of our first album. Every song from the first album done live in concert last year. Plus a bonus track that Phil Collen produced called Save That Goodness. We've got a new video for it."